Rating: 85 percent based on 838 votes. 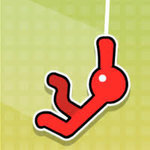 Description: Stickman Rope is an addicting stickman game where you need to swing from rope to rope to successfully reach the end of the level without dying. Each level is harder than you thing because you have to account for gravity and the angle of the rope in your swings.